Visiting Iceland is a dream for many travelers, but there is no secret that Iceland is one of the most expensive and sought-after destinations to travel to. A week-long trip to Iceland will easily cost anywhere from $2-$5K to cover van rental, flights, food, and gas. 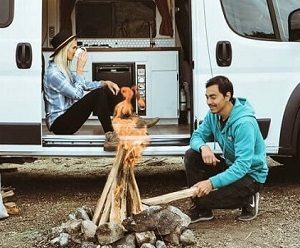 We know personally because we spent a whole week driving around Iceland’s Ring Road in a campervan rental and it was to date the most expensive trip we’ve ever splurged on. If this is out of your travel budget don’t be discouraged because it doesn’t mean that you should miss out on all the awesome sights that have made Iceland such a great travel destination. From black sand beaches to waterfalls, volcanoes and hot springs, a trip to Oregon offers many similar attractions to Iceland but for a fraction of the cost. We’ve already covered how to travel to Portland, Oregon for $30 round-trip using Spirit Airlines’ Penny Fares, so a trip to Oregon is well within everyone’s budget. 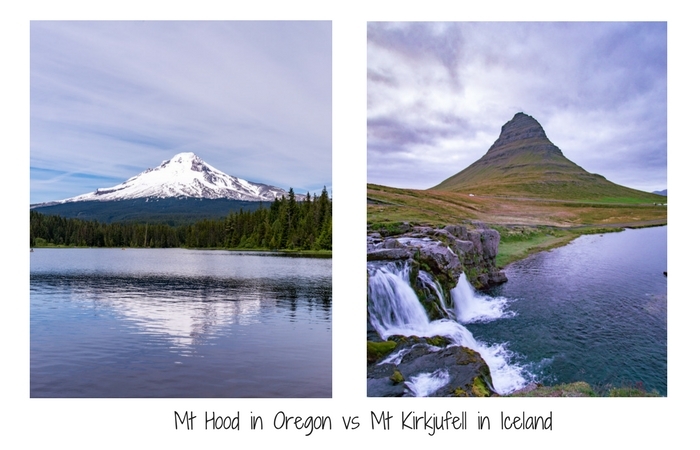 Here are 10 amazing equivalents in the ultimate battle of Oregon vs Iceland that will make you forget all about Iceland and change your course to Oregon, USA. Both Iceland and Oregon are filled with volcanoes and the remnants of when those volcanoes where actively erupting and changing the landscape. A similar trait that both Oregon and Iceland share as a result of the past volcanic activity are black sand beaches. 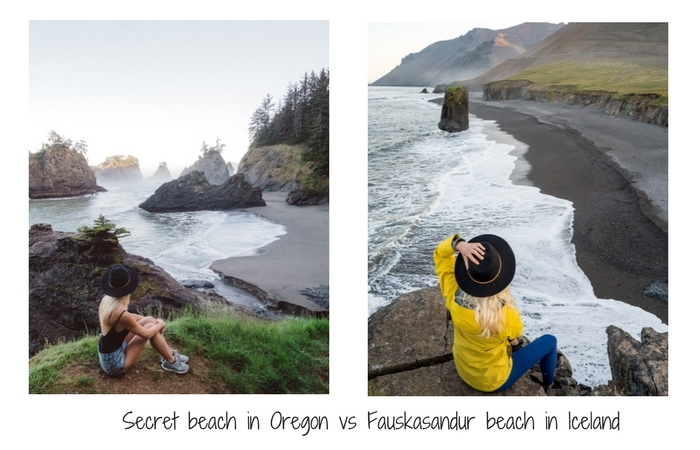 The Secret Beach in Oregon is an amazing little gem with beautiful beaches and epic cliff views made of black basaltic rocks, similar to the Fauskasandur black sand beach in Iceland. One of the best parts about visiting both Oregon and Iceland are the endless waterfalls that can be found just about everywhere. After living in Oregon for a year, hunting for waterfalls has become quite the fun hobby for me. 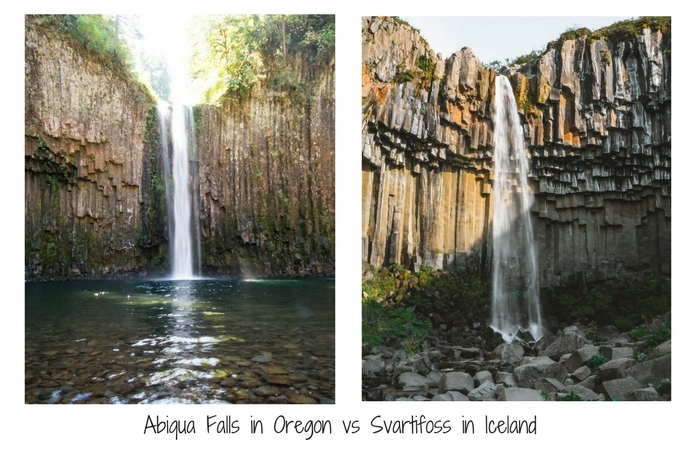 You can imagine my excitement when I found out that some of the waterfalls in Oregon and Iceland share a similar trait of basalt columns that have formed around the waterfalls as a result of volcanic lava tubes. 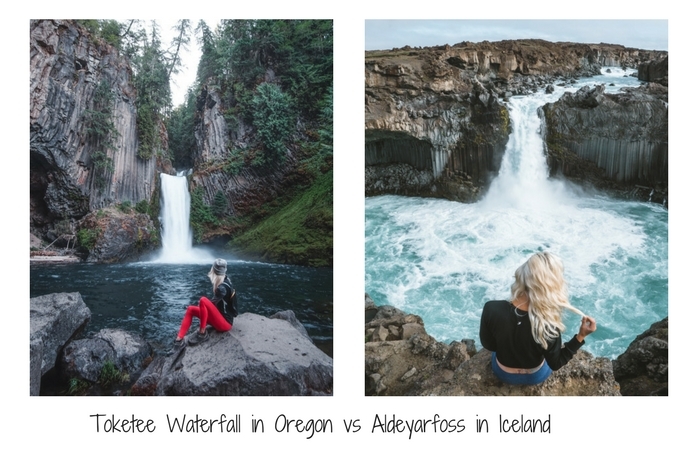 Both Toketee waterfall in Oregon and Aldeyjarfoss waterfall in Iceland share this similar trait and both are equally stunning. 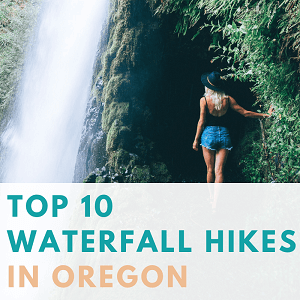 For a full list of my 10 top favorite waterfall hikes in Oregon, you can read more here. 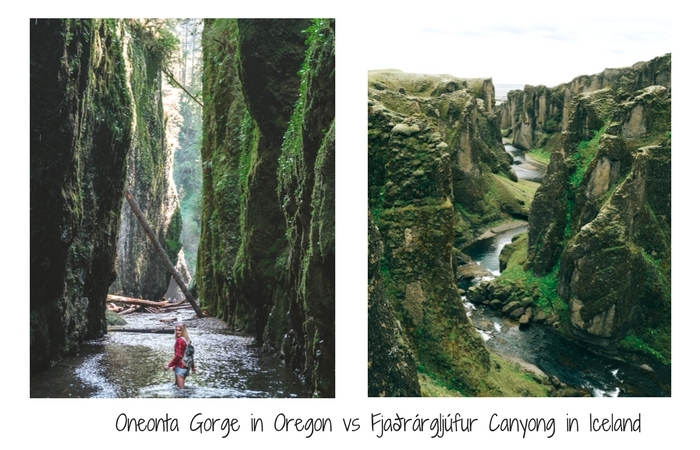 The Oneonta Gorge in Oregon and the Fjaðrárgljúfur canyon in Iceland are true miracles of nature. Both are deep canyons carved by the river below with beautiful mossy green cliffs surrounding you from every side. 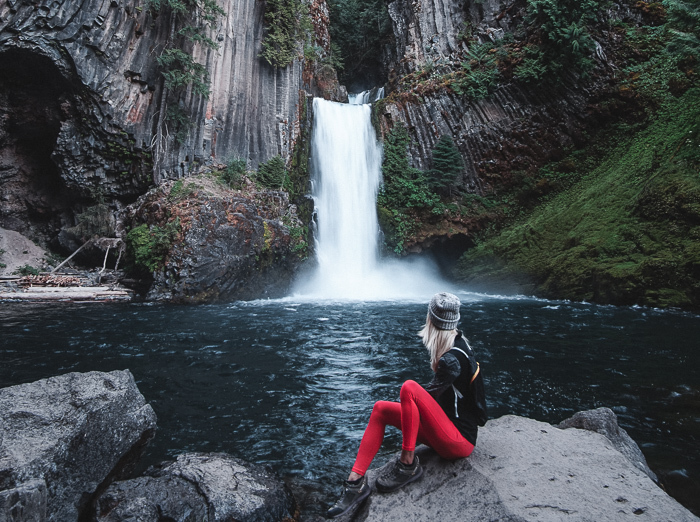 Where the Icelandic canyon is much bigger and wider, the Oneonta Gorge is a more adventurous hike with a rewarding waterfall at the end of it. The Oneonta Gorge is only 30-minute drive from Portland so it’s the perfect short hike for anyone visiting Portland for the weekend. For other awesome waterfall hikes near Portland, check out our guide to the Columbia River Gorge waterfalls in Oregon. While most people visiting Iceland stick around the Ring Road drive, the central inland area has some amazing colorful hills called Landmannalaugar. These mountains are quite remote and hard to get to so most people skip this area on their trip. 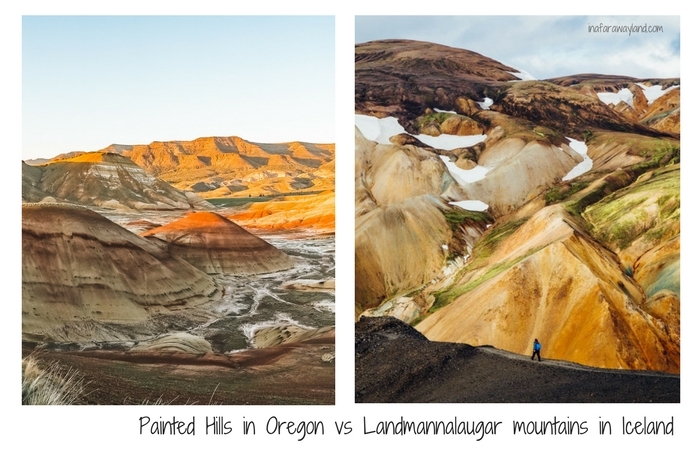 In Oregon, the Painted Hills are equally mesmerizing and colorful and are just a short drive away from Bend, OR. One of the most popular waterfalls in southern Iceland is the Seljalandsfoss falls. Visitors can walk up to and behind this grand waterfall into a small cave that leads around it, just like the waterfalls at Silver Falls State Park in Oregon. The Silver Falls State Park is famous for its 8-mile loop around the park that features 10 amazing waterfalls and caves. There’s nothing better after a long day of chasing waterfalls than hanging out and taking a dip in some relaxing natural hot springs. Landbrotalaug hot springs in Iceland, a popular spot for both the locals and tourists alike, offers a great place to relax after a long day of driving Iceland’s Ring Road. 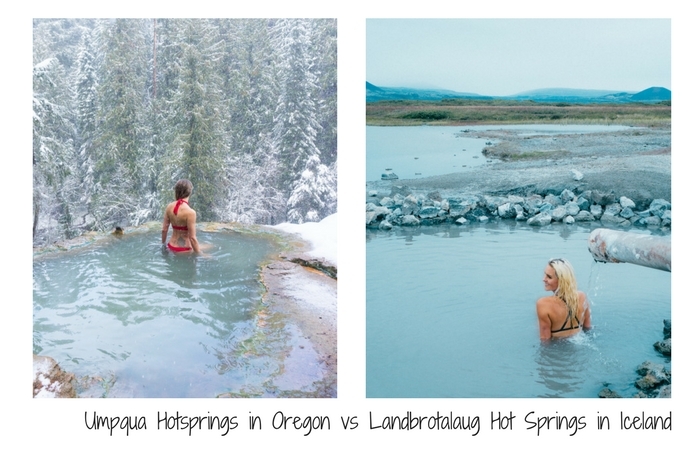 But few hot springs can compare to the serenity of Umpqua hot springs in Oregon, which offers multiple hot spring tubs cascading on a mountainside, nestled deep in the midst of nature. 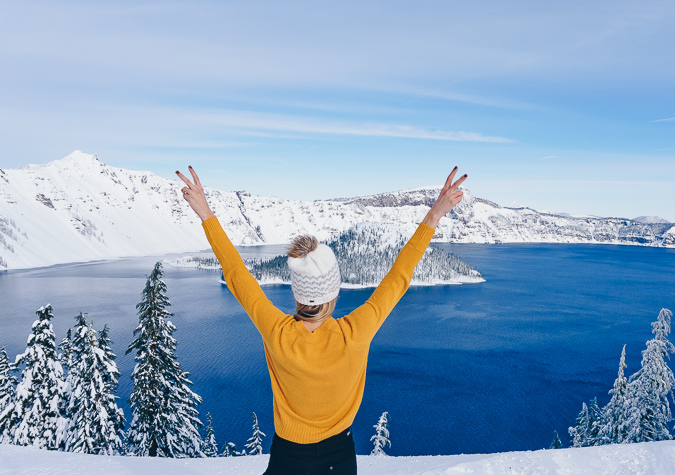 Similar to Kerið Lake in Iceland, Crater Lake in Oregon formed inside a volcanic crater and is one of the main attractions for tourists visiting the area. Both are equally breathtaking, but they do come in a variety of colors. 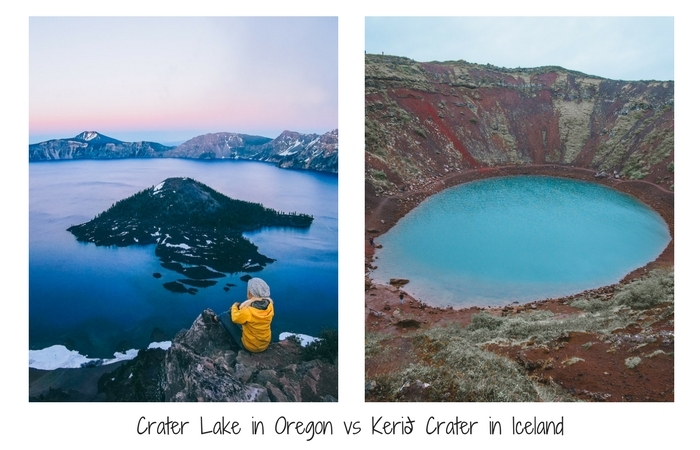 Where Crater Lake is a deep blue color that is hard to truly capture on camera, Kerið crater is aqua blue with red sand walls surrounding it all around. While driving around Iceland, visitors can enjoy endless coastal views, each just as awe-inspiring as the last. One of the most beautiful areas to go hiking in Iceland is the Longdrangar cliffs viewpoints in Snaefelles Peninsula. Similar to Iceland, Oregon has its own breathtaking coastline drive. 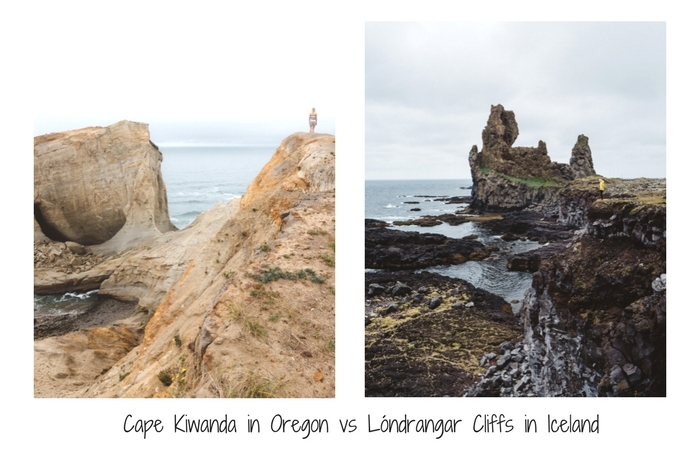 Cape Kiawanda is a perfect example of the beauty found on Oregon’s coast with endless hiking possibilities, cliffs, caves, enormous sand dunes, and beautiful nature all around it. Our article on 15 Things To Do Along the Oregon coast covers more on Oregon coastline’s beauty and the best places to visit on a road trip along the Oregon Coast. The Kirkjufell Mountain is one of the most photographed places in Iceland, but Mt Hood in Oregon stands close to it in both beauty and popularity. Mt Hood is a great place to visit year round for activities like skiing and snowboarding, but one of the most breathtaking places to fully capture its grandeur in full scale is from Lake Trillium. The Svartifoss waterfall in Iceland is almost a split image of the Abiqua waterfall in Oregon. Both waterfalls share the orange-brown basalt columns supporting the plunging water above and both waterfalls require a 30-40 minute hike into a cove at the base where hikers are rewarded with a stunning, intimate view of the towering waterfall right before their eyes. You don’t need to fly halfway around the world to enjoy some of the most beautiful locations on Earth. While Iceland is trending as one of the top travel destinations right now, Oregon has many of the same traits as Iceland without the ridiculously high cost or tourists crowds. While Oregon is still very low key and under the radar, our prediction is that it won’t stay that way for long. 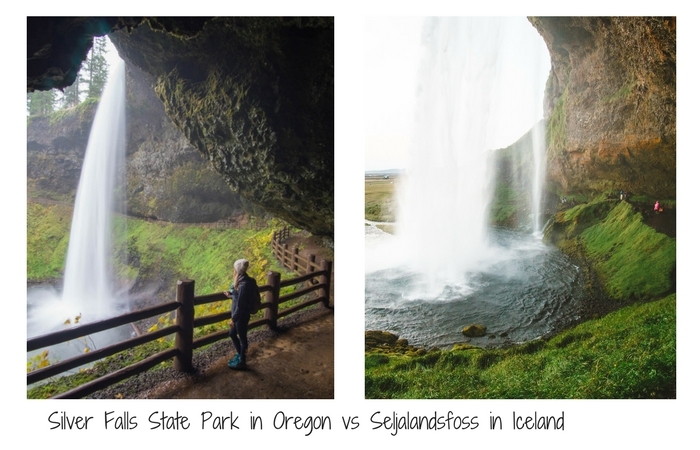 Which one was your favorite, Oregon USA or Iceland? Share your favorite destination with us in the comments below! Laura, what time of year did you go to these spots in Oregon? Are they close together? Hi-we are planning to fly into Portland Oct 25 for 4 days for Fall foliage, mountains,etc. romantic getaway-Can you help with must sees? We don’t care about night life- and like to picnic etc and be outside.. Thank you so much for the info! I was wondering what was the best place to fly in to as we are from Florida. Looks like Portland will be it! I will start getting this trip planned 🙂 Looks amazing! If it’s your first time visiting Oregon, Portland is the best place to fly into since most of Oregon’s best attractions are located within a few hour drive from Portland. I highly recommend starting with Columbia River Gorge area and exploring other areas from there on. Let me know if you have any other questions! Awesome post!!! I’d have to say, Oregon won in a lot of your photos!!! I’m a Portland native planning a trip to Iceland in September, I’m excited about Iceland but I’ll always love Oregon best. One thing people don’t always know about Oregon is that there are plants that will thrive in Oregon and only one other place in the world. So it’s a gardeners dream location! We have plants from South America, China, Japan, etc all living happily side by side. No other place in the world can beat it! Awesome article!! Been wanting to do Iceland for awhile, but might give Oregon a go! Oregon is such an incredible location! And so cheap compared to Iceland : ) Hope you make it out there! Wow amazing comparisons! Thanks for sharing this! This is an AMAZING post thank you! I can see a lot of work put into it with the comparisons! Just planned my road trip next week and added about five of these stops to it! Easy planning! These are amazing spots! I love all your posts of Oregon, I can’t wait to visit in November!! Thank you so much, Tiana! Hope you have a wonderful trip in November. Fall in PNW is such a great time to visit with the cooler temperatures and fall colors. Enjoy! I have been to Iceland but this article definitely made me want to plan a trip to Oregon to get that feeling I had without the price. I saw the question as to what time of year is best to go and understand you lived there. What would you suggest is the best to visit to get the most out of the experience? Oregon is amazing! Yes, I did live in Portland for a year so I got to explore Oregon in different seasons. My favorite seasons were spring around April-May when everything is starting to look lush and green. I also enjoyed fall for the fall colors and lesser crowds. I would avoid going late November to February because the weather gets super cold and many hikes get closed due to snow and harsh conditions. International travel always sounds glamorous, but I’m glad you brought up an alternative local option that is affordable and offers the same results. It’s great to know that Oregon is just as amazing as Iceland and nowhere near the same cost. Happy to provide the comparison and an alternative to the expensive international travel : ) Iceland is one of the most beautiful places in the world and such a sought-after destination right now but during our trip there, we kept saying “Wow, this waterfall looks just like the one in Oregon” and “Doesn’t this beach remind you of the one in Oregon?”. Oregon has such a diverse landscape and really is just as breathtaking in nature and scenery as Iceland, just for a fraction of the cost. Can you see the Aurora borealis from Oregon? That’s a great question! I have personally never seen Aurora Borealis from Oregon but I did some reading on it and it seems that occasionally it’s possible when the weather conditions are just right (high K-index of geomagnetic activity, clear skies, no moon, etc). Here’s a link to a Facebook page that is used to track Aurora Alerts. Umpqua Hot Springs is a gross spot as of 2018. Luke warm waters which probably isn’t sanatary with clothes and garbage left behind. It is a pretty view though. Maybe in the winter the springs feel hotter and It’s not kept up like it might have been. Oregon is a beautiful state. And I am proud to live here. Oh no! That’s unfortunate to hear. When we visited it was quite lovely, clean and warm. We did go in the winter and we were the only people there. Oregon is such a beautiful state! We loved living there and can’t wait to return in the future. It’s not even comparable… Not at all. I’ve been to both destinations dozens of times, and Iceland wins hands down. Iceland is no doubt an incredible destination to visit. We had it on our bucket list for a while but international travel wasn’t always in our budget. I just wanted to provide an alternative option to other people that might be in the same situation. Happy travels! Thank you for this post! I’m moving to Portland in a few months and can’t wait to check all of these out. Amazing! We lived in Portland for a year and absolutely loved it. Portland is so fun and there is so much to see within an hour or two drive. 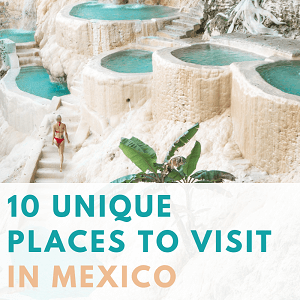 I was so inspired by this post that I planned my spring break road trip to visit as many of these spots as I could! Oregon did not disappoint! Thank you for sharing and for inspiring me to explore such a majestic place! Hey! wonderful blog and amazing pictures of Oregon. After seeing your pictures, I also wanna visit in Oregon. But I wanna ask you till I did not see any post about India. I traveled most highlighted places in India. Next trip What about India tour with Palace on wheels luxury train, it covers various places of India. Glad you enjoyed the Oregon blog post. It certainly is a wonderful place to visit and hope you get to one day! I’ve never written anything about India because I’ve never been there. To provide better suggestions to my readers I only write about places that I have personally visited. I do hope to go there one day!